As producers and solo artists we play many roles, which can make the transition to performing a little overwhelming (if we even consider it at all). There are many feasible options, from hiring a backing band to plugging in the aux cable (hear me out), and a lot in between. Whether you’re looking to perform your tracks live for the very first time or seeking ways to stimulate your live show, this article offers suggestions worth considering for producers at all stages. If performance isn’t your priority, consider this: as the means to completely control one’s own artistic and professional trajectory become more accessible, so grows the real possibility of pursuing your art at its most elevated level. 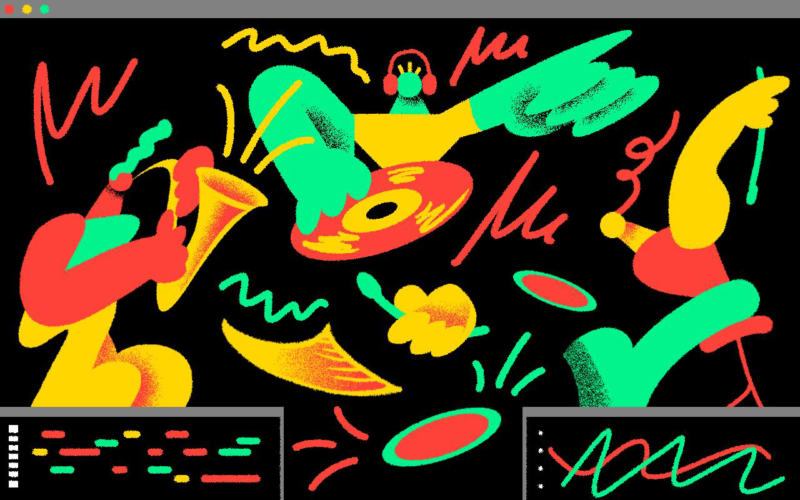 More and more producers are cutting through the cultural fog, breaking into the popular foreground as whole creative contenders, owning their songs in all senses. Performance and visual self-representation are important ways of communicating your message and establishing your artistic self. So, here’s the challenge – how do you capture the nuance of your music in all its complex glory and rearrange it as a performance? Hire the right people. To state the obvious, this is probably the most expensive option, but the long-term payout will likely be worth it. And if you add up the expenses that some of these other tips require (computers, interfaces, cables, etc. ), it might be reasonable to get a band together after all. Assembling an ensemble of musicians drastically increases possibilities while also allowing you to focus on fewer things, ensuring each musical building block gets the attention it deserves. On the flip side, it means you have to do significant work up front. As the leader, be clear on your workflow and intentions. Will you be providing lead sheets? How much room is there for collaboration? Do you want to hire freelance musicians and maintain ownership of the project, or try to cultivate a long-term band that will probably take on a life of its own? Whatever you decide, playing and creating with others will inevitably lead to something you could not have done with your abilities alone. This might be scary, but the outcome is worth it, always. For obvious and perfect examples, see Anderson .Paak & The Free Nationals or Son Lux. We’re at a cultural juncture wherein new artists look to Tiny Desk for their big break, and it’s not uncommon to hear about your favorite songwriter doing an unplugged cross-country living room tour. There’s so much potential in a stripped-down performance. And for a number of reasons, this sort of intimate experience has caught social fire. The essence and effect of your song should shine through, even in its basest form. Maximize the range and impact of your voice and focus on the feeling. Accompany yourself how you’re most comfortable – acoustic guitar is a common and fine choice, but creativity is key (think an old Casio keyboard, glockenspiel, or maybe an Omnichord if you’re lucky). Above all, people want to hear something true, and sometimes the surest path to truth is simplicity. Embrace the challenge of paring down your track to its most essential elements. It will make you a better performer and producer, and perhaps instrumentalist as well. Given a Push and a laptop with Ableton Live on it, it’d be easy to conclude that we have officially achieved peak possibilities in music production and performance. It’s finally harder to imagine what can’t be done than what can be done in terms of live looping, making it a viable performance option for many solo artists. If the technology you used to record the music is reliable enough to use for performance, think about ways it could be used to recreate songs, and manipulate them as live loops instead of just launching prepared samples. Live loops are most effective when they’re organized and concise – unless the loop is undeniable, it’s easy to let it go on for too long. Here’s a challenge if you’ve never tried it: take one of your songs and try recording and immediately manipulating loops from the ground up as part of an actual song performance. Where would you start and what would you need to have set up beforehand? MIDI-controllers and Ableton Live are an obvious choice, but if the computer prerequisite is a turn-off, there are some good pedal and hardware options out there as well. It’s a difficult skill to pull off, but there’s a growing list of exemplar practitioners whose art speaks for itself, foreshadowing an impending shift in the paradigm of music production. Given so many boundary-pushing and ingenious examples (James Blake, Jacob Collier, Merrill Garbus, Binkbeats, and Mark de Clive-Lowe, to name a few), it’s easy to imagine a future where producers are judged against a very different rubric. There are whole genres built in the wake of the impact of specific hardware devices, so I understand if it seems like a flippant suggestion for you to “use hardware” to enhance your live show. If you didn’t use specific hardware to make your music, you probably don’t need it for the performance either. But despite the fact that we have all the sounds we’ll ever need on our computers, there’s something about manipulating a drum machine and controlling the output as a real audio signal that adds a different kind of energy to the process. If you’re committed to performing solo, this option is especially enticing. Combine hardware with prepared samples or loops (launched via controller or standalone sample launcher), and you can come up with a solid and somewhat spontaneous performance. I’m not advocating buying more stuff, but maybe there are instruments within reach that you haven’t really considered, in particular smartphones and tablets. There are countless apps for classic drum machine recreations, synthesizers, sequencers, weird sound design tools, and even Ableton Live controllers that you could be incorporating into your performances right away. It would be unfair to let it go unsaid that there’s no shame in singing or playing along to a track (if you need convincing, see St. Vincent). On a logistical level, it just makes sense. On a cultural level, the way each generation relates to music will be different, and it must be allowed to evolve. If this means that someone is making new music and getting to experience the joy and healing that performance can bring, and better yet there are audiences connecting to that performance in a deep, emotional way, then it’s a good thing. Some of the most memorable shows I (and probably you) have seen involved someone essentially singing along to their track on Spotify. If this encourages more people to make and share music, then it’s a good thing. People who love your music want to connect with you in any way you offer them. They will come to see you perform because they love the music they heard online, but don’t underestimate their willingness to explore new territory. Music lovers are eager for variety and asking to be pushed out of their comfort zones, and producers are being called to do the same. Bringing your songs from the safety of the studio to the spontaneity of the stage is a creative challenge unlike any other, with unmatched rewards. Dane Galloway Dane has a master's degree in education from the University of Pennsylvania and is the Education Coordinator for Believe In Music, a high school music technology program in Baltimore. He plays guitar and tours with electronic pop trio Vita and the Woolf.